The Aquatic Vertebrates Facility has the capacity to house 3000 aquariums with approximately 50.000 fishes. In an area of over 300 m2 area, the facility is divided in four individual units housing 4 different species: zebrafish (Danio rerio), Medaka (Oryzia latipes), Xenopus laevis and Xenopus tropicalis are maintained. In addittion to wild-type lines, at the facility we also have transgenic and mutant lines. The main room of the facility houses 23 of 8 multi-level racks holding 3 liters tanks and 19 of 5 multi-level glass racks for zebrafish and medaka. 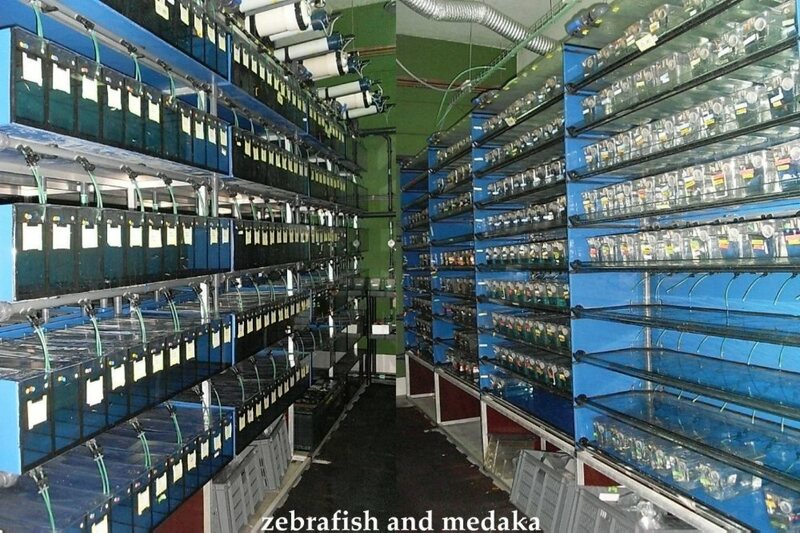 The second room has 4 of 8 multi-level racks holding 3 liters tanks and 2 of 5 multi-level glass racks for medaka. We have two additional rooms with 2 of 3 multi-level racks for Xenopus laevis and 1 of 8 multi-level rack for Xenopus tropicalis. The water is generated by an inverse osmosis system and all racks are recirculating systems.? Aquatic vertebrates facility phone: +34 954977445/39 (ext. UPO 67439/67445) ? Facility supervisor: Juan Ramón Martínez Morales. Senior technician: M ª Del Rocío Morales Falcón. Support technical personnel: Ana Álvarez Martínez, Solángel Rivero Gil and Silvia Esquina Navarro.